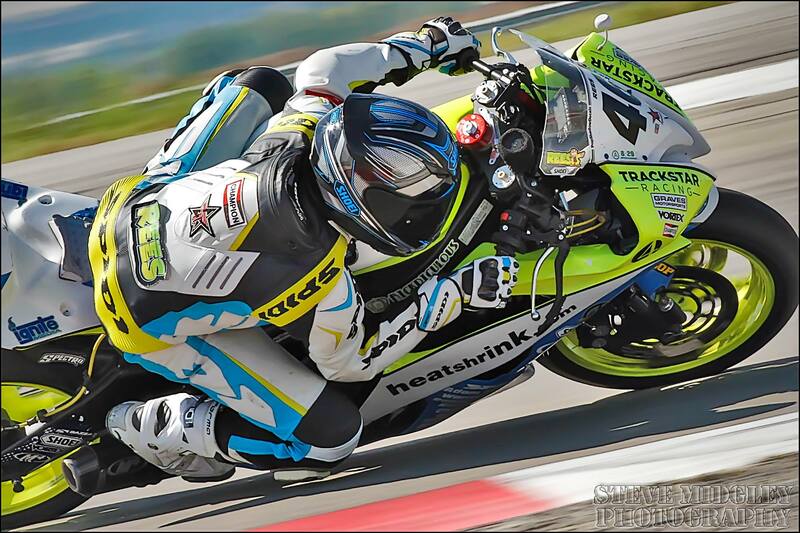 (Tooele UT) After 2 days of battle in the high desert heat of Utah, 14-year-old Gauge Rees brought his Trackstar Racing / Heatshrink.com Yamaha R6 home on top of the box in the Utah Sportbike Association Moto 2 race. The win also put him in the points lead for the Class Championship. Rees was also able to secure a 3rd in WERA National Challenge C Superstock and a 2nd in WERA National Challenge C Superbike on the same day. Trackstar and Gauge would like to thank their Sponsors for their support. Heatshrink.com, Rickdiculous Racing, Champion Spark Plugs, Shoei Helmets, Spidi, Western Powersports, Arrow, Speedmob, Spectro, Jeff Stern and Fastline Performance, Dunlop Tires, Vortex Racing, Venhill Brake Lines, Apex Trackdays, PopShadow Decals, Dana Wilson and Mark Reo. Also their friends and family who support their effort. Trackstar Racing is a full service motorcycle shop located in West Haven, Utah. Chilly conditions and mixed weather made for some surprising racing at round 1 of the Vortex Masters of the Mountains race series hosted by the Utah Sport Bike Association at Miller Motorsports Park. Round 1 was held on Miller’s technical East course configuration which provides racers with a little bit of everything including some fantastic overtaking opportunities. Saturday saw wet conditions all afternoon forcing racers to mount up rain tires to do battle. Young Gauge Rees who is beginning to make a name for himself as a wet weather specialist impressed everyone with his pace in the conditions. He took victory in the Moto2 class with relative ease setting a pace that was unmatched. In the Middleweight Superbike Gauge again took victory but only after being closely chased by Brian Childree for the first three laps. Gauge was able to push even harder and set an amazing 1:47.4 on a cold, wet track stretching out a gap and going onto to take the victory. This would be the fastest lap time of the day, even faster than the best times of the Open Superbike racers. Sunday begin much how Saturday ended, very wet and very cold. Luckily, the sun appeared midday and by the afternoon the track was dry and the racing was on. The premier middleweight class, King of the Mountain GTU saw a fierce battle between Gauge Rees and Michael Bradshaw with Bradshaw eventually pulling a gap to take the victory. Immediately following was the premier open class race, King of the Mountain GTO. The race began with Jerry Hicks taking an early lead after starting from the second row followed closely by Oleg Pianykh. Lap after lap the two riders grinded out a pace that was unmatched by anyone else on the grid. The battle was building toward what was sure to be a dramatic finale, but on lap 9 Hicks broke a shift rod and was forced out of the race, handing the victory to Pianykh. Bradshaw, who is normally a protagonist in the King of the Mountain GTO race was dropped off the back of the top two riders, surely feeling the effects of back-to-back races, was able to pick up the pieces and take a second place finish. The final round of the 2014 Vortex Masters of the Mountains series was held on the East Course configuration at Miller Motorsports Park on September 27th and 28th. Weather played a factor on Saturday’s Deseret Dash doubleheader with both races held on a wet and cold track. Despite the conditions, 13 year old Gauge Rees “did the double” winning both races and beating a lot of much more experienced riders in the process with his smooth, and calculated riding. Gauge has made huge progress since the beginning of the season aboard his Trackstar Racing Yamaha YZF-R6 and is impressing a lot of people with his riding as well as his attitude. Remember that name and expect to hear it more in the future. Sunday looked to have more of the same weather but as dawn broke the skies cleared and the track dried. In the King of the Mountain GTU class, Chad Swain led into turn 1 with Dave Purcell and Brian Childree following closely behind. On lap 3, as Swain began to break away Childree passed Purcell and began to close the gap. Though the two were very close for a number of laps Childree was never able to mount an attack and Swain went on to win the race and secure his King of the Mountain GTU Championship ahead of Childree finishing second and Purcell finishing third overall. The premier King of the Mountain GTO race proved to be one of the most exciting of the season. Jerry Hicks pulled the Holeshot into turn 1 and led Oleg Pianykh and Chad Swain for four laps until on lap five Pianykh got an incredible drive exiting turn 12 onto the front straight and was able to use the power of his MotoStation prepared GSX-R1000 to pass Hicks before turn 1. From then on the three riders were absolutely inseparable creating what looked like a Tour de France-style pace line, never having more than .3 seconds between them. The stage was set for an epic battle in the closing laps but it wasn’t meant to be. On lap ten the leaders caught a lapped rider on the front straight and only Pianykh was able to get by before turn 1. Hicks and Swain lost too much ground and were unable to close the gap before the checkered flag and Pianykh went on to celebrate his third-straight King of the Mountain GTO Championship. First I want to thank all of the Riders who support my shop and give me the opportunity to do what I love. Thank you! Thanks to the guys who ride for me, you make it all worth while! I want to thank our Sponsors who make it all possible. Heatshrink.com, Kimber Kable, Ray Kimber, Rickdiculous Racing / Adam Bronfman and Ricky Bronfman, Champion Spark Plugs, ‪#‎teamchampion‬, Spectro Oils, Apex Trackdays, Ken Hill, Shane Turpin, Spidi and Western Power Sports, Shoei Helmets North America and Jessica Brown, M4 Exhaust, Vortex Racing, Joe Salas, Steve Midgley Motorcycle Photography, Ignite Media Utah, Dunlop andScott Larsen, Öhlins USA, Venhill Brake lines, Bazzaz, and Popshadow Decals. We couldnt do this without each and every one of you and hope you know how much your support means to us. Gauge Rees: Gauge won both Deseret Dash races in the rain on Saturday. On Sunday he brought home 3rd in HVWT Superbike, 4th in Middleweight SS and 5th in KOMU. Season Championship standings: 2nd overall, 3rd HVWT Superbike, 4th Middleweight SS and 4th in KOMU. Its been a fantastic season! Mark Reo: Mark won the Novice U race on Sunday and also took the win in Combined U. It was a great weekend for Mark! Season Championship: Mark too 3rd in the Novice GTO Championship, 2nd in the Novice GTU Championship and 3rd in Combined U. Excellent first season on the track! Devan Deamer: Devan won the Production 250 race on Sunday and also clinched the Production 250 Championship. Devan also set the new track lap record on East for the 250 class. Devan also locked up 4th place in the Moto 3 Championship. Ryan Richardson: Ryan won the Deseret Dash Novice race 1 and took second in race 2 on Saturday. He locked up 4th in the Twins U Championship, 2nd in the Moto 3 Championship and 7th in Novice U.
DonovanNcharity Busby: Donovan locked up 2nd in the Production 250 Championship and 5th in the Moto 3 Championship. Unfortunately he was not able to race round 6 due to work obligations. 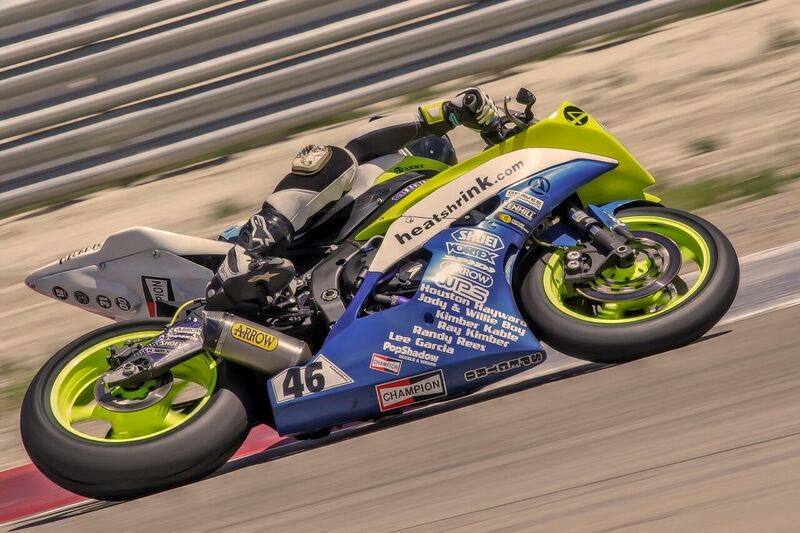 Michael Hawkins: Michael was able to secure 4th in the Heavyweight Superbike Championship, 2nd in Formula 5, 5th in KOMU and 5th in Middleweight Superstock. Mike had a great year and didnt have a single crash. Again, thanks to everyone for their support and for giving me the opportunity to work with you. Next year is going to be exciting! Copyright 2014 Trackstar LLC All images are the property of Trackstar LLC and used with permission of the photographer.